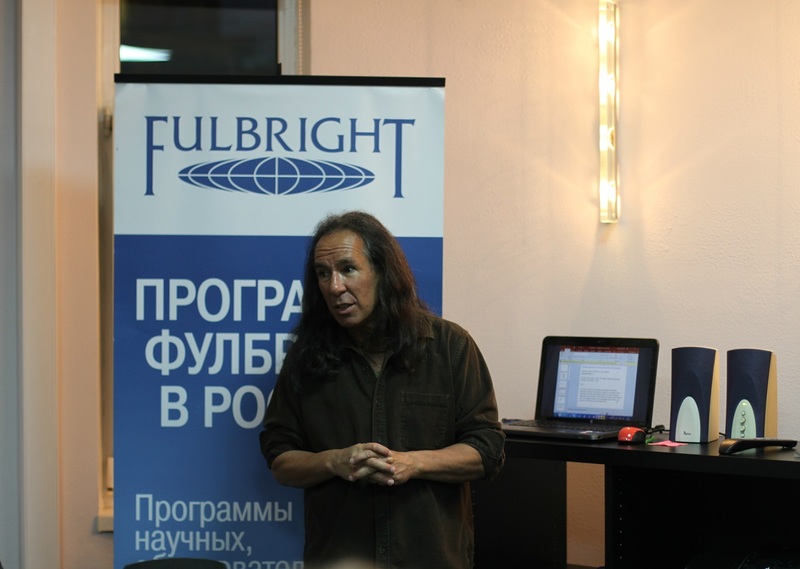 The Fulbright Program in Russia | Alumni Salon "Culture and Art of American Indians"
Alumni Salon "Culture and Art of American Indians"
On October 10, 2017, the Fulbright Program Office in Moscow hosted its fifth Evening Alumni Salon on "Culture and Art of American Indians" with US Fulbright Program grantee and alumnus David Erben as the keynote speaker. Erben is a Native American who was born and raised on the Mescalero Apache Indian Reservation in New Mexico. He is an enrolled member of the Chiricahua Apache Nation, an active member of the American Indian Movement, and a professor of literature at the University of Toledo, Ohio. 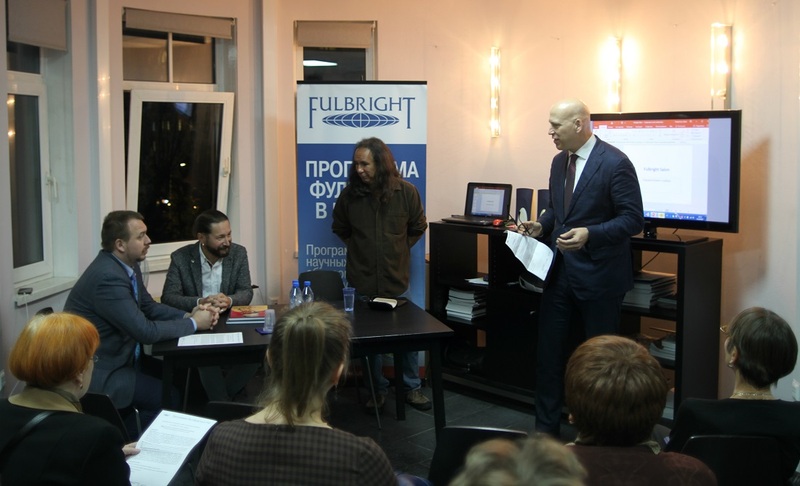 Currently a US Fulbright Scholar to Southern Federal State University in Taganrog, Professor Erben first visited Russia in 2001, when he spent nine months at Novosibirsk State University as a Fulbright Scholar. Since then, he has returned as a Fulbright Specialist with invitations from various Russian universities to lecture on Native American history, literature, and cultures. 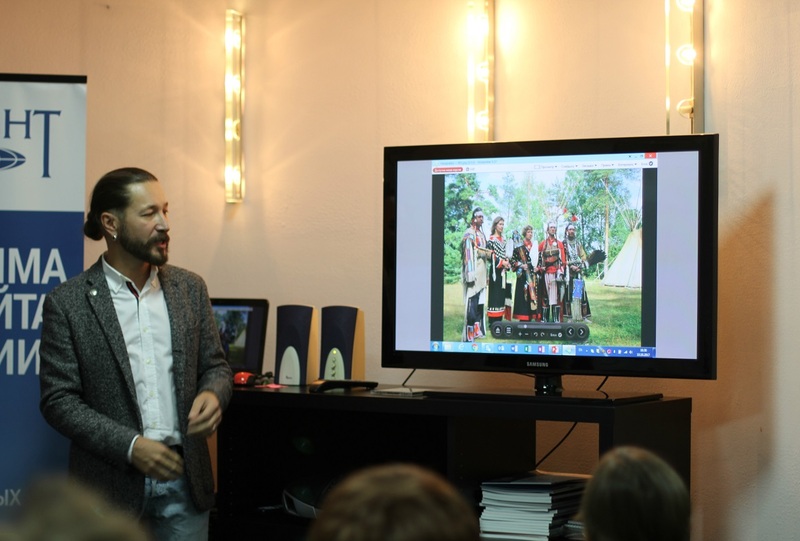 Erben’s talk at the Alumni Salon featured everyday life of Native Americans, especially on reservations, with illustrations of historical facts and examples of arts and crafts produced by young Native Americans, and even Native Indian-themed rap music. Erben is in regular contact with Russian citizens who study the history, culture and art of Native Americans and are learning Native American languages, too. One such Russian, Mikhail Vinogradov, was invited to speak at the Salon as well. Vinogradov – ethnographer and organizer of Pow-wow festivals of Indian culture in Russia, and an Indian Summer School – collaborates with fellow “Indianists” to reconstruct costumes and household items of Indian tribes. Vinogradov has been devoted to the study of Native American culture since his childhood, when he began to read extensively about Indians. He now produces art objects based on information found in books, Internet sources, and learned from Russian ethnographers. Vinogradov displayed his works while speaking to the alumni audience at the Salon, told everyone about the Pow-wow festivals, how he arranges and conducts them with his colleagues and other people interested in the culture. Also, thanks to modern technologies and the Internet, he is in regular communication with Native Americans, some of whom ask him to make art objects for them and later send him photos from ceremonies where the objects are used. 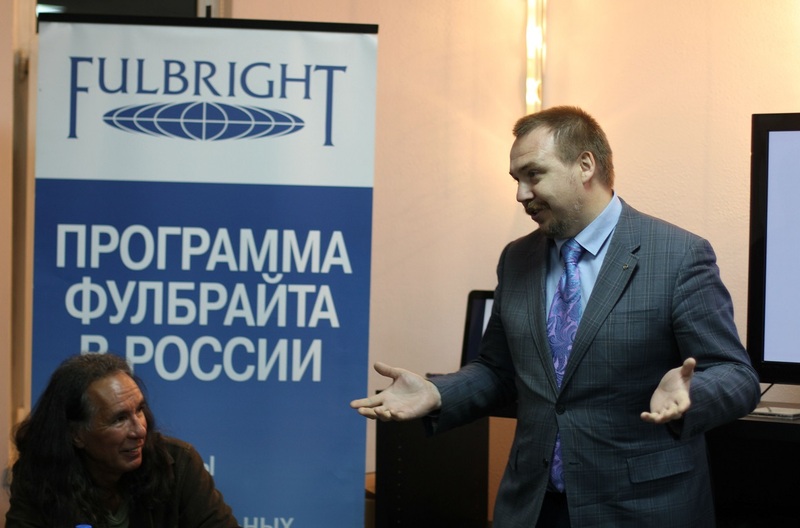 We also invited a Russian Fulbright Alumnus, Alexander Molodin to the Salon. Molodin is an architect, a research scientist and a specialist in the History of Architecture of Russian settlements in North America; a field in which he has been engaged for nearly 20 years, while teaching and conducting research at Novosibirsk State Academy of Architecture and Arts. Molodin and his research team fully restored an image of a Russian nineteenth century fortress in Hawaii, St. Elizabeth's fortress. Presently, he participates in the restoration of the famous Fort Ross fortress in California. In the 2015-16 academic year, in the framework of the Fulbright Program for scholars, Alexander conducted research at the Library of Congress, and also at the George Washington University, Department of American Studies; Washington, DC. At the Salon, he spoke about North American Indians in the Pacific region discussing common features and historical and architectural connections between the Siberian peoples of Russia and North American Indians, including his discoveries and research results in this area. Invitations to the Salon on Native American Culture on October 10th were sent to alumni engaged in Cultural studies, Literature, Musicology, History, Arts, American studies, Psychology, Education and other fields. At the Salon, we had a special guest – ECA Senior Officer Micaela Iovine, who was visiting the Moscow Fulbright Office the week of the event. We were also glad to host Michele Petersen, Assistant Cultural Affairs Officer of the US Embassy in Russia. All the guests actively participated in discussion following the keynote speakers’ presentations and Fulbright alumni shared their personal experience gained during the Fulbright grants.